WASHINGTON, Sept. 23 /PRNewswire-USNewswire/ — JunkScience.com announced today that it was taking its “Carbon Criminal” WANTED poster advertisement campaign to Pittsburgh for the G-20 economic summit. The campaign will protest the CEO of Pittsburgh-based Alcoa, Klaus Kleinfeld, who is lobbying for the Waxman-Markey cap-and-trade legislation that will wreck the U.S. economy. The purpose of the WANTED poster campaign is to spotlight the CEOs who belong to the U.S. Climate Action Partnership (USCAP) and who have teamed up with America-hating green groups to lobby for legislation that would make energy dramatically more expensive and that would eviscerate the American dream and standard of living, while not accomplishing anything positive for the environment. 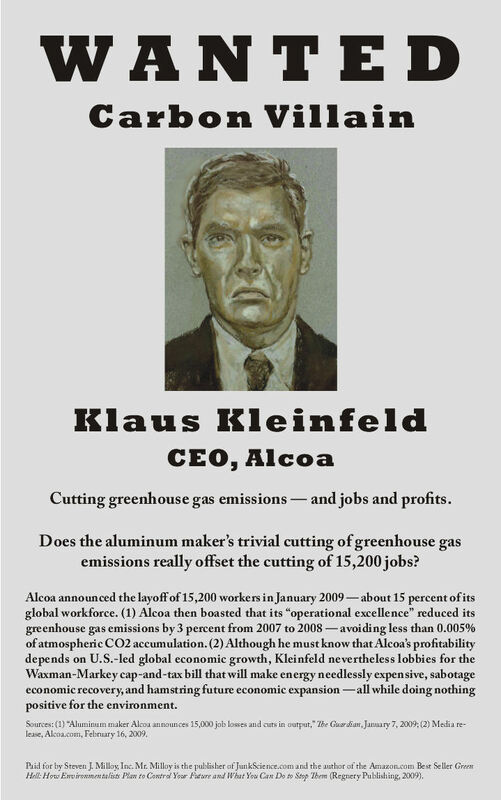 The Kleinfeld WANTED poster notes that after Alcoa announced the layoff of 15,200 workers in January 2009, it then had the temerity to boast that its “operational excellence” reduced its greenhouse gas emissions by 3 percent from 2007 to 2008. “Kleinfeld cut 15% of his workforce due to the global economic slowdown and then boasts about CO2 emission cuts that amount to avoiding less than 0.005% of atmospheric CO2 accumulation,” observed Milloy. “If I were a CEO that just laid-off that many employees, the last thing I would be doing is touting nonsense in support for policies that would keep those workers unemployed,” Milloy added. 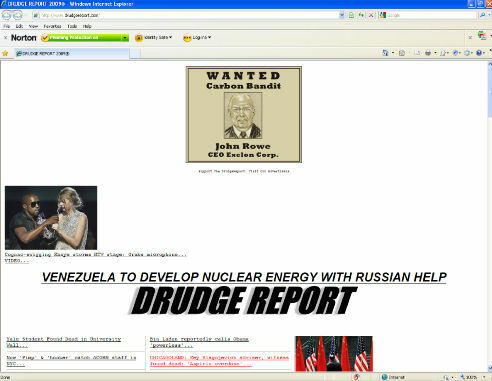 JunkScience’s WANTED poster campaign kicked off last week by running a poster advertisement of John Rowe, the CEO of USCAP member Exelon Corp., on the Drudge Report in Exelon’s hometown of Chicago. 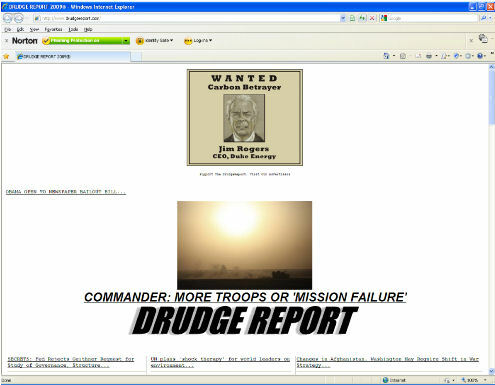 JunkScience continued the Drudge Report campaign this week by running an ad featuring Jim Rogers, CEO of USCAP member Duke Energy, in Duke’s hometown of Charlotte, NC. “The Senate is about to take up the Waxman-Markey bill in hopes of enacting it before December when President Obama goes to Copenhagen to submit the U.S. to a United Nations-run international cap-and-tax agreement,” Milloy notes.